Zomato’s FY19 revenue from food delivery business grew by a breathtaking over 307% to $155 million. This milestone is touched in one year’s time, as in FY18, Zomato’s this business gave revenue of just $38 million. Zomato in its annual report for FY19 stated that the food delivery business has grown at a faster rate than dining out. The restaurant discovery platform's revenue from food delivery grew by over 307% to $155 million as compared to $38 million in FY18. The revenue from dine out also increased to $49 million from $30 million posted in FY18. The data indicates that customers prefer to get their food delivered instead of going out. “Over 100k restaurants are listed in India, generating an annual run-rate GMV of over $1.5bn. ~94% of these deliveries are fulfilled by our ~180k strong active delivery fleet," the company said in its report. “Unit economics of the food delivery business have come a long way. We now lose Rs 25 per delivery, compared to Rs 44 per delivery in March’18. Our last mile cost per delivery is now Rs 65, compared to Rs 86 in March’18. The key driver metric of unit economics — number of deliveries per rider per hour has gone up to 1.4 from 0.9 last year," it added. Riding on the popularity of food deliveries, Zomato posted an overall revenue of $206 million, up by a whopping 202% compared to $68 million in FY18. However, Zomato also highlighted that revenue grew three times compared to previous fiscal. Their current annual revenue run rate is $350 million. “We have had tremendous growth aided by promotional marketing spends to acquire new users and be the first-to-market in many cities in India. In our experience, being first-to-market gives us a distinct competitive advantage in the food delivery sector,” it said. The food delivery service platform has enhanced strongly in India. This has also intensified competition in the online market. Now apart from Zomato, platforms like Swiggy, Foodpanda, Pizza Hut, JustEat, TastyKhana and FoodMingo are among top players. Interestingly, Uber which entered the Indian market, with online taxi service, had also launched Uber Eats. 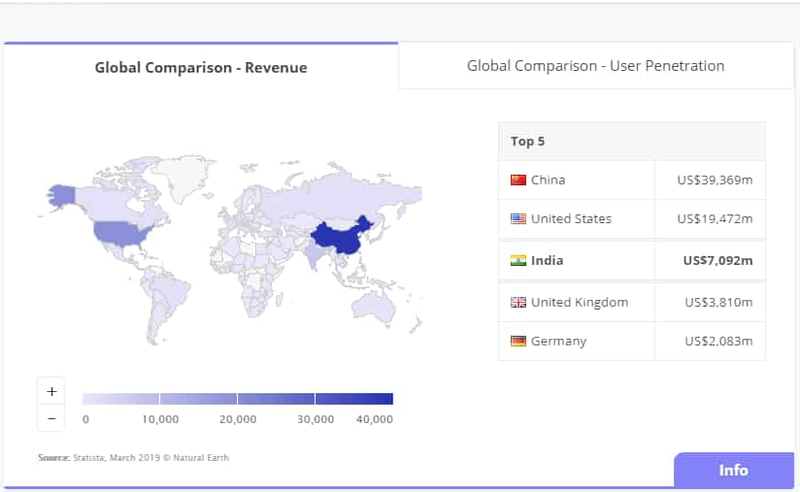 Data by Statista highlights that India stands at third spot in food delivery market with revenue of $7,092 million so far in 2019, following United States which is at second spot with revenue of $19,472 million and China taking the lead with revenue of $39,369 million. Data also showed that, majority of users that opt for food delivery are between age group of 25 to 34 years of age. This is followed by age group of 18 - 24 years and 35 - 44 years. Statista states that online food delivery revenue is expected to show an annual growth rate (CAGR 2019-2023) of 9.9%, resulting in a market volume of $10,363 million by 2023.The market's largest segment is Restaurant-to-Consumer Delivery with a market volume of $5,825 million in 2019. 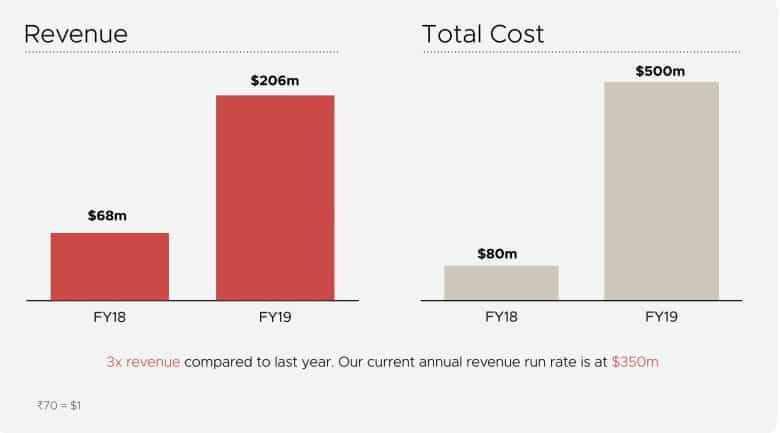 “In FY19, Zomato shifted its focus on scaling up the Delivery business, from reducing the cash burn for about two years. While we do not have Swiggy’s KPI, we believe Zomato has emerged as one of the leaders in the delivery space with ~33m exit monthly deliveries. Higher fleet utilisation has improved the unit economics, which suggest a modest monthly burn rate of ~USD12mn. That said, the company aspires to reach 1,000 towns in India, from 200 currently, which would require investments and, hence, the burn rate may not come down meaningfully," the duo added. "Business leveraged the strong proposition of Zomato Gold, which helped it report strong 63% growth in revenue. We believe the fast-maturing restaurant discovery platform is a potential cash cow that can fund investments in other businesses," they added.